We’ve all been there—a shin to a coffee table or a trip on the sidewalk can leave you with a black-and-blue or two. But what is a bruise, exactly? “A bruise is a reflection of minor injury to the blood vessels under the surface of the skin. If these vessels are damaged, a small amount of blood can leak out, giving the classic blue, black or purple discoloration,” says Cory Fisher, DO, family medicine physician at the Cleveland Clinic. But what if you seem to be bruising easily, developing bruises on your legs, arms, and other parts of your body from even just a slight bump, or seemingly out of nowhere? Keep reading to find out what else could be causing your unexplained bruising—and how to heal a bruise faster. Some dietary supplements may contribute to unexplained bruising, including feverfew, garlic, ginger, gingko, ginseng, omega-3 fatty acids (fish oil), saw palmetto, and vitamin E. This is a good reminder to talk to your doctor before you take any supplement for any reason—not only can they can interact with other meds you’ve been prescribed, but they also aren’t FDA-regulated, so you may not be swallowing exactly what you expect. 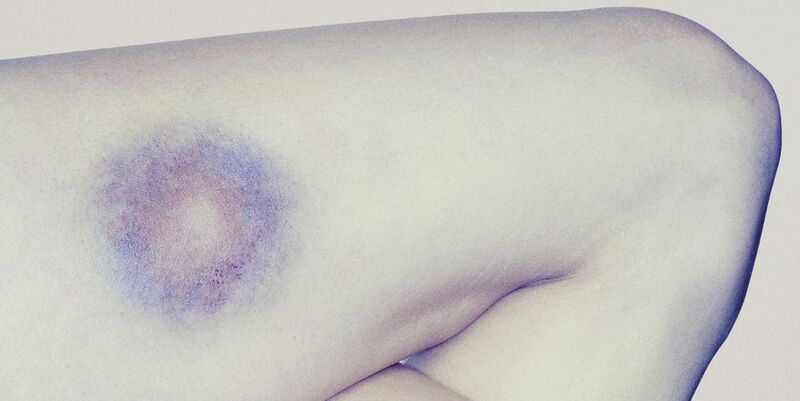 Unfair, but true: Women tend to bruise more easily than men. Guys have thicker skin, and they also have more collagen, which holds blood vessels more securely in skin and protects them from trauma. Estrogen also plays a role in unexplained bruising. Studies have shown that it prevents blood vessel walls from building. And it also acts as a vasodilator, which means it opens up blood vessels. If trauma happens, more blood can slip out before it’s able to clot. If you’re on a blood-thinning medication to treat heart arrhythmia or blood clots, that’s a simple explanation for unexplained bruising, says Dr. Fisher. But you may also be taking other drugs that have a blood-thinning effect without even realizing it, like ibuprofen or aspirin. Hemophilia and von Willebrand disease are both blood disorders that can cause easy bruising, says Dr. Fisher. Hemophilia is a rare condition that affects the blood’s ability to clot, putting someone at risk for severe bleeding from just a slight injury. Von Willebrand disease is a milder and somewhat more-common clotting disorder often characterized by bleeding during dental work, long-lasting nosebleeds, blood in urine or stool, and heavy periods. “Some of the most well-studied include SSRIs, like fluoxetine, sertraline, citalopram, and bupropion, can interact with platelets, which are an important part of the clotting process,” says Dr. Fisher. Deficiencies in vitamin C and vitamin K can cause unexplained bruising—but if you live in a developed nation and have regular access to healthy food, then it’s highly unlikely this one applies to you. These deficiencies typically occur only in severely undernourished populations, explains Dr. Fisher. First, the bad news: It can take up to two weeks for a bruise to heal, and there’s not a whole lot you can do to make them disappear faster. “As the body absorbs this lost blood, it goes through a few phases. After just a few days, the blue/black/purple discoloration and any swelling will typically improve and the color changes to green or yellow,” says Dr. Fischer. “It may then look light brown before healing completely.” But there are a couple tricks that may speed healing. Right after you’ve thwacked your knee or bumped your elbow, grab an ice pack and hold it on the affected area for 10 minutes a few times a day. This will constrict the blood vessels, in turn slowing the spread of the purple discoloration in the first place.